On July 4, The Iroquois Indian Museum will host its Early Technology Day, billed as a hands-on learning experience about life in early America. Visitors can watch and participate in the process of flint knapping (the ancient art of making chipped stone tools), Primitive fire making, Atlatl spear throwing and early archery. There will be displays of projectile points, tools, and local archaeological finds from the Museum’s archaeology department. Have you ever found an artifact? Please bring it with you and the Museum’s experts will try to identify it for you. Currently on display at the Museum is the exhibition, &#8220Birds and Beasts in Beads: 150 Years of Iroquois Beadwork.&#8221 The exhibit features more than 200 beaded objects, largely from the collection of retired archaeologist and Museum trustee, Dolores Elliott. Early Technology Day takes place from 10 a.m. to 4 p.m. The event is free with paid admission to the Museum. The Museum is open from 10 a.m. to 5 p.m. Tuesday through Saturday and from 12 Noon to 5 p.m. on Sunday. It is closed Monday. Regular admission is $8 for adults, $6.50 for seniors/students and $5 for children ages 5-12. Children under five are free when accompanied by an adult. Special group rates are available by calling the Museum at 518-296-8949. For more information contact the Iroquois Indian Museum at (518) 296-8949, info@iroquoismuseum.org or visit www.iroquoismuseum.org. The Iroquois Indian Museum opens for its 2012 season on May 1 with a new exhibit and special events planned throughout the year. From May 1 until the closing day on November 30, the Museum hosts the exhibition, &#8220Birds and Beasts in Beads: 150 Years of Iroquois Beadwork.&#8221 The exhibit features more than 200 beaded objects, largely from the collection of retired archeologist and Museum trustee, Dolores Elliott. In addition to the exhibit, the Museum has a Nature Park of 45 acres and a Children’s Museum &#8212- an active, hands-on area &#8212- where Iroquois traditions are introduced through crafts, games and technologies. The Museum has a full schedule of special events in 2012 (see below). Events at the Museum are free with paid admission. The Museum is open from 10 a.m. to 5 p.m. Tuesday through Saturday and from 12 Noon to 5 p.m. on Sunday. It is closed Monday. Regular admission is $8 for adults, $6.50 for seniors/students and $5 for children ages 5-12. Children under five are free when accompanied by an adult. Special group rates are available by calling the Museum at 518-296-8949. For more information, visit www.iroquoismuseum.org. 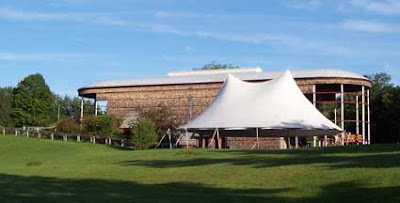 May 26 & 27: IROQUOIS CULTURAL FESTIVAL: Join the Iroquois Indian Museum at New York State Historical Association in Cooperstown for their first festival featuring Iroquois artists, dancers and storytellers. June 3: from 1:00 – 3:00: PLANTING A THREE SISTERS GARDEN AND STORYTELLING: Visitors are invited to help us plant a Three Sisters Garden of corn, beans and squash. Traditional Iroquois stories about planting and the natural world will be shared. July 4: EARLY TECHNOLOGY DAY: Visitors can watch and participate in the process of flint knapping, using local and semi-local cherts and lithics, fire making, atl-atl spear throwing, and early archery. There will be displays of projectile points, tools, and local archaeological finds from our archaeology department. Onota’a:ka, based in the central New York Haudenosaunee community of Oneida, was founded by Elder and Wolf Clan Mother Maisie Shenandoah for the purpose of cultural education. While Maisie passed away in 2009, the troupe’s original purpose continues to be carried forth by daughter Vicky, granddaughter Tawn:tene (Cindy Schenandoah Stanford) and an extended family with common goals. For the Schenandoahs dance is not a separate expression of heritage and thanksgiving, but one that is thoroughly integrated into daily life. The dancers will demonstrate a variety of traditional Iroquois Social Dances and encourage participation from the audience. Social songs vary in length, verses and tempo depending on the song selection of the singers. All dances are done in a counter clockwise direction. The instruments used in the social dances in various combinations are the water drum, the horn rattle, hard sticks and the beating of the feet on the floor. July 28: IROQUOIS SOCIAL DANCE SATURDAY: Iroquois performers will demonstrate a variety of traditional Iroquois Social Dances and encourage participation from the audience. Social songs vary in length, verses and tempo depending on the song selection of the singers. All dances are done in a counter clockwise direction. The instruments used in the social dances in various combinations are the water drum, the horn rattle, hard sticks and the beating of the feet on the floor. August 11: IROQUOIS SOCIAL DANCE SATURDAY with the HAUDENOSAUNEE DANCERS from Onondaga. The Haudenosaunee Dancers perform Iroquois social dances as practiced in their small traditional community near Syracuse. Elegant and knowledgeable, leader Sherri Waterman-Hopper has traveled internationally as an artist and cultural speaker. The Dancers feature a core group of seasoned singer/musicians and talented and dedicated young adults. Pride in the culture and adherence to the traditions are the hallmarks of this disciplined troupe. The dancers will demonstrate a variety of traditional Iroquois Social Dances and encourage participation from the audience. Social songs vary in length, verses and tempo depending on the song selection of the singers. All dances are done in a counter clockwise direction. The instruments used in the social dances in various combinations are the water drum, the horn rattle, hard sticks and the beating of the feet on the floor. September 1 & 2: 31ST ANNUAL IROQUOIS INDIAN FESTIVAL: Festival offerings include Iroquois music and social dance, traditional stories, all-Iroquois art market, games and Native food. More highlights include wildlife exhibits, archeology ID table, and flintknapping demonstrations. The Iroquois Indian Museum in Howes Cave, NY has announced significant staff cutbacks for 2012. &#8220Severe economic downturns coupled with the recent devastating flooding in Schoharie County have forced the Museum to suspend most Museum operations from January 1 to April 30 and to layoff staff during those months,&#8221 Museum officials said in a prepared statement issued Wednesday. Normally, the Museum closes from January 1 to March 31, but to conserve finances we will remain closed to the public until May 1. A skeleton staff with volunteer help will continue to maintain the basic operations of the Museum including security and maintenance. There are no plans to cancel the 31st Annual Iroquois Indian Festival, Dance Saturdays during July and August, or other public programs scheduled for the 2012 season. &#8220The Board and Staff believes that we have an obligation to the founders of the Museum and to all who have supported us over the years to assure that we continue to be a viable public institution, to support tourism in our region, to teach about the Iroquois, to be of benefit to Iroquois people, and to fulfill our mission as an educational institution,&#8221 the statement said. The Iroquois Indian Museum of Howes Cave, New York, will host the 30th Annual Iroquois Indian Festival on Saturday, October 15 through Sunday, October 16 (date corrected 10/14). Festival offerings include Iroquois music and social dance, traditional stories, all-Iroquois art market, games and Native food. New this year will be a silent auction on Saturday from 10 to 5, on the main floor of the Museum will feature contemporary and vintage Native artwork- limited edition Yankees and Red Sox Native player collectibles- Native performers autographed memorabilia- local business gift certificates- antique books- music & DVDs- and more. The Sky Dancers from Six Nations Reserve in Ontario will perform traditional Iroquois social dances. Also for the first time, audience members will be invited to participate in a Smoke Dance competition with prizes for adults and children. Additional highlights include: Children’s Activities Tent- wildlife rehabilitator Kelly Martin with a variety of recent rescues- Pamela Brown “Wolf Teacher” returns to promote understanding and awareness of wolves- archeology ID table- survival skills presentation with Barry Keegan- and flintknapping demonstrations. The Festival is supported in part through grants from The New York State Council on the Arts, and donations from members and friends of the Museum. The Iroquois Indian Museum is located just 35 miles west of Albany New York, near the intersection of highways 7 and 145. Take exit 22 from Interstate 88 and follow the signs. There is a fee for entrance to the Festival grounds. For more information contact email info@iroquoismuseum.org or visit the museum’s website. The Iroquois Indian Museum in Howes Cave, NY has announced the second in a series of three “Social Dance Saturdays” featuring Iroquois social dance groups. On Saturday, July 23, the HAUDENOSAUNEE DANCERS from Onondaga will perform three sets at approximately 11, 1, and 3. Visitors are encouraged and welcomed to join in with the dancers. Led by Sherri Waterman Hopper, the Haudenosaunee Dancers will perform Iroquois social dances as practiced in their small traditional community near Syracuse. Sherri Waterman-Hopper has traveled internationally as an artist and cultural speaker. The Dancers feature a core group of seasoned singer/musicians and talented and dedicated young adults. Pride in the culture and adherence to the traditions are the hallmarks of this troupe. Hopper is also a designer and seamstress who incorporates her knowledge of the construction and significance of traditional outfits into her presentations. For more information contact the Museum at 518-296-8949, info@iroquoismuseum.org or visit their website. 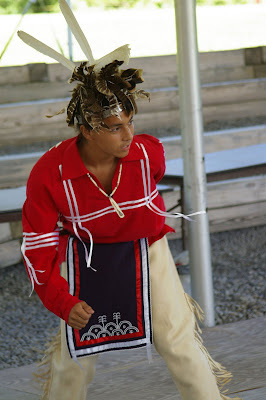 Photo: Haudenosaunee Dancer from 2010 (provided). The Iroquois Indian Museum in Howes Cave, NY has announced their 2nd Early Technology Day on Saturday April 30 from 10 am to 4 pm. Put on your warm clothes and waterproof boots and head to the museum for flint knapping demonstrations, atl-atl shoot with Mike Tarbell, Mohawk educator and various demonstrations of early technology. We will have demonstrations of the brain-tanning and smoke curing of deer hides, dog bane rope making, and various 18th century crafts, as well as hunting, trapping and fishing displays. There will be plenty of show and tell and crafts. The archaeology department will have a staffed display of local finds and information and will be on hand to help identify your artifacts. “Iroquois Artistic Visions: From Sky World to Turtle Island” is an exhibition featuring new works by contemporary Iroquois artists in addition to art from the Museum’s permanent collection that will run from April 1 through December 31, 2011 at the Iroquois Indian Museum in Howe’s Cave, NY. Paintings, sculpture, pottery, beadwork, textiles and other media in the exhibition will focus on the important symbols in the Iroquois Creation Story, which is fundamental to understanding Iroquois culture and society because it expresses what is valuable in Iroquois culture. The story contains ideas that define the Iroquois role relative to the universe and confirms their attachment to a land on which their ancestors have lived for at least ten thousand years. It helps to explain their survival as a distinct ethnic group participating in a multicultural world. This exhibition takes a concept that was traditionally oral and translates it by using a number of exciting and contemporary visual forms. Many of the artists featured in the exhibition are expected to attend the Gallery Opening . A full color companion book for the exhibition will also be available for sale in the Museum Shop. In the spirit of traditional Eastern Woodland Native American culture, Jerry and Cheryl Schenandoah will be at the Iroquois Museum with their custom handmade Native American deerskin clothing, arts and crafts on December 9 – 12, 2010. On-site deerskin demonstrations will take place each day noon through 5:00pm. The Schenandoahs are Native designers and creators of traditional and contemporary deerskin clothing and accessories including bags and fur hats. They will also have items made from deer antler and deer bone such as chokers and bracelets. A large collection of silver jewelry will also be on display and for sale. Custom orders will be welcome.